Tiles with this design are associated with the shrine of Eyüp, which stands just outside the walls of Istanbul. The pattern is not self-contained. It can be repeated endlessly, like a textile design. Each group of four tiles has the complete pattern, which is symmetrical on the vertical axis. 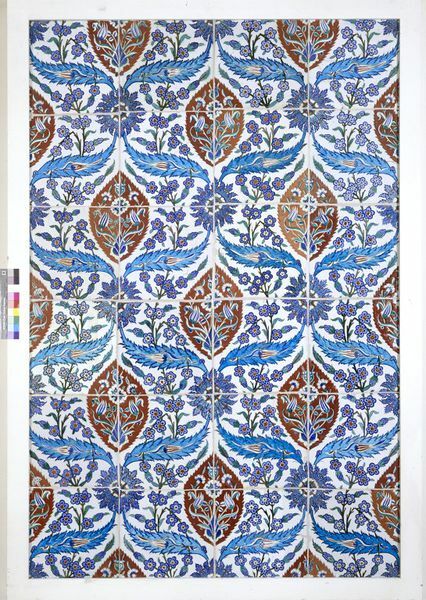 The tiles were produced at the Iznik potteries near Istanbul. The imperial court renewed its patronage of Iznik ceramics during the construction of the Süleymaniye mosque in Istanbul in 1550 to 1557. The first Iznik tiles were produced, and potters added a bright red to the range of colours painted under the glaze. This was achieved with a slip made from a special clay. In the following decades, tiles of high quality were decorated in red, green and tones of blue on a white ground. Dishes, bottles and other vessels had similar decoration on white or coloured grounds. 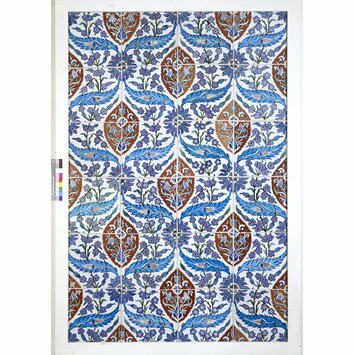 Panel of tiles with repeating pattern of wing-like turquoise saz leaves flanking large red leaf motifs among branches with violet-blue flowers. Said to be from the baths at the mosque of Eyüp Ansari in Istanbul. Tiles with this design are associated with the shrine of Eyüp, which stands just outside the walls of Istanbul. The pattern is not self-contained but can be repeated endlessly, like a textile design. Each group of four tiles has the complete pattern, which is symmetrical on the vertical axis. The placement of a tulip inside each of the large turquoise saz leaves is a stylistic innovation of the late 1570s. Panel of tiles with repeat pattern, Turkey (Iznik), around 1580. John Ayers, Oriental Art in the Victoria and Albert Museum (London: Philip Wilson Publishers, 1983), pp. 120-21. Nurhan Atasoy and Julian Raby, Iznik: The Pottery of Ottoman Turkey (London: Alexandria Press, 1989), fig. 477 (tiles from same mosque). Tiles with this design are associated with the shrine of Eyüp, which stands just outside the walls of Istanbul. The pattern is not self-contained but can be repeated endlessly, like a textile design. Each group of four tiles has the complete pattern, which is symmetrical on the vertical axis. Tiles with this design are associated with the shrine of Eyüp Ansari in Istanbul.